"Why are there so many different bird house plans?" Many bird house plans are species specific and for good reason. For example, cavity-nesters require different entry-hole diameters. 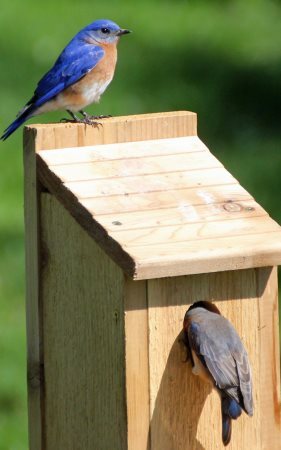 A hole size for bluebird house plans will be different than one for chickadees. There are even different recommended hole sizes for each species of bluebirds such as Eastern, Western and Mountain Bluebirds. This chart has bird house dimensions and hole sizes for 34 species. It is also important to make the appropriate size hole because it will exclude certain undesirable species. For example, a hole size 1 1/8 inch in diameter will exclude starlings and house sparrows, which often monopolize nest boxes and even evict more desirable species. So it is important to choose the appropriate bird house plan for the species you wish to attract. This is a more elaborate design, but gives you a quick look at one type of bird house design. View our birdhouse plans further below for an easier to build box. Approximately 1 dozen cavity-nesting birds will use boxes with a 1 1/2" entrance hole. 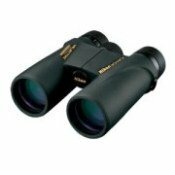 These include Tree & Violet-green Swallows, bluebirds, chickadees, wrens, nuthatches, and possibly titmice. Wrens will use holes that are smaller than 1 1/8" in diameter. Woodpeckers will prefer larger holes, 2 1/2" across. 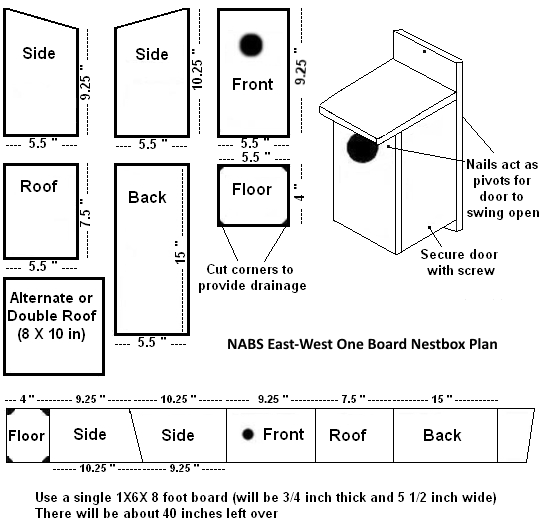 Below is a one-board bird house plan from the North American Bluebird Society (NABS) that will attract a variety of birds to nest. If you want more species specific designs, such as for bluebirds, purple martins, wrens, robins, chickadees, owls or others, then view our bird house dimensions chart. Birds nest in different habitats. So if you place your house in an open field, you are more likely to attract bluebirds or swallows. If you place your house in a more wooded area, you are more likely to attract chickadees or nuthatches. So if you want to attract a certain species to your box, keep in mind their natural habitat when looking for a location. Your bird house site should not be surrounded by thick foliage, as parents need an open flight path to and from the nest. All locations should have an abundance of food, protective cover, and water. Don't put a perch on the nest box. This makes it easier for raccoons, squirrels, cats and other predators to reach inside. 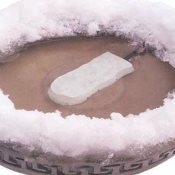 The roof or one wall should be hinged, so the box can be opened and cleaned after use, and there should be small drainage holes in the bottom. I always think simpler is better, but some woodworkers like to make really elaborate and fancy birdhouses. That's okay if that's what you want, but the bird house in the video below is way over the top, don't you think?! If you mount a box on a pole, tree, or post, the same predator guard devices used for bird feeders should be included. Some examples of predator guards are cone baffles or metal/PVC sleeves around the pole, tree, or post the house is mounted on. Many use them to keep squirrels out of their feeders, but they can also be used to keep predators from climbing up and into the nest box.There are also baffle blocks or Noel wire raccoon guards that can be placed around the entry-hole. 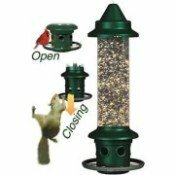 More information about installing a bird house entrance hole guard protector or restrictor to prevent squirrels or other animal predators from chewing the entrance hole to a larger size, allowing access to the adults and nestlings. Some birds will not nest in bird houses. Only cavity nesters will use next boxes because they nest in natural cavities, such as in dead trees that are hollow inside. 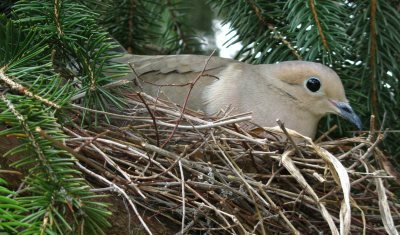 Birds that build nests, for example, in between the branches of trees or shrubs such as goldfinches, cardinals, and doves, will not use a bird house. You can attract robins and phoebes by providing them a nesting shelf or platform. This is a tray-like ledge with a roof, attached to a tree or the side of any kind of structure, like under the eave of your house or porch roof. Similarly, Barn Swallows will use an unroofed shelf under the eave of a building. Wooden strips nailed under the eave on the outside of a barn or other large building in the open will make it easier for cliff swallows to attach their nests. After the nesting season is over, knock off the swallow nests, so that each pair will build a new one. This avoids occupation by house sparrows before the swallows return. Variety of plans for Eastern, Western and Mountain bluebirds. This bluebird house design keeps eggs and nestlings cool on hot days. Nest Shelves and platforms for Robins and Phoebes. For house wrens, Carolina wrens and Bewick's wrens. Classic kestrel next box design with tips on construction. For 34 species; chickadees, hawks, owls, wrens, nuthatches, more. If you like to build in general, then you probably would enjoy these 14,000 woodworking plans that includes bird house plus many more building projects for furniture and more. Step-by-step instructions for how to build a bird house by carving and hollowing out a tree log. Great for cavity nesters. What kind of materials to use, roof slant, entrance hole shape, etc. General information about bird house designs and species specific nest box plans. Wood duck, Barrow's goldeneye, common goldeneye, hooded merganser, common merganser and bufflehead are all cavity nesting ducks. More free information about building bird houses. Winter Bird House Plans - Provide a winter bird roost or shelter to keep birds warmer during the winter months. Features of a good birdhouse, building the right bird hosue, tips on nest box placement, dealing with predators and more. Purple martins nest colonially in martin apartment houses. Bird house plans for martins vary from very simple to quite elaborate. Gourds may be used for martins as well and are very popular in the south. Hard shell gourds are members of the species, Lagenaria, also called bottle gourds. They can be suspended from crossbars on a tall pole. Gourd Birdhouses -How to grow gourds and how to dry gourds in order to make gourd birdhouses for purple martins or other cavity-nesting birds. Also birdhouse gourds for sale and seeds. Multi-level, multi-rooms designs for Purple Martin colonies. Photos of Bluebird house and Mourning Dove courtesy of ptgbirdlover and Katie Tegtmeyer, respectively, at flickr.